Post: Gaurav Akrani. Date: 10/08/2011. No Comments. Label: Finance. The need, significance or importance of corporate governance is listed below. Imgage Credits © Sameer Akrani. Changing Ownership Structure : In recent years, the ownership structure of companies has changed a lot. Public financial institutions, mutual funds, etc. are the single largest shareholder in most of the large companies. So, they have effective control on the management of the companies. They force the management to use corporate governance. That is, they put pressure on the management to become more efficient, transparent, accountable, etc. The also ask the management to make consumer-friendly policies, to protect all social groups and to protect the environment. So, the changing ownership structure has resulted in corporate governance. Importance of Social Responsibility : Today, social responsibility is given a lot of importance. The Board of Directors have to protect the rights of the customers, employees, shareholders, suppliers, local communities, etc. This is possible only if they use corporate governance. Growing Number of Scams : In recent years, many scams, frauds and corrupt practices have taken place. Misuse and misappropriation of public money are happening everyday in India and worldwide. It is happening in the stock market, banks, financial institutions, companies and government offices. In order to avoid these scams and financial irregularities, many companies have started corporate governance. Indifference on the part of Shareholders : In general, shareholders are inactive in the management of their companies. They only attend the Annual general meeting. Postal ballot is still absent in India. Proxies are not allowed to speak in the meetings. Shareholders associations are not strong. Therefore, directors misuse their power for their own benefits. So, there is a need for corporate governance to protect all the stakeholders of the company. Globalisation : Today most big companies are selling their goods in the global market. So, they have to attract foreign investor and foreign customers. They also have to follow foreign rules and regulations. All this requires corporate governance. Without Corporate governance, it is impossible to enter, survive and succeed the global market. Takeovers and Mergers : Today, there are many takeovers and mergers in the business world. Corporate governance is required to protect the interest of all the parties during takeovers and mergers. 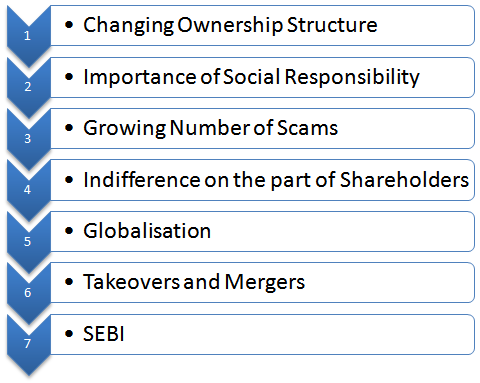 SEBI : SEBI has made corporate governance compulsory for certain companies. This is done to protect the interest of the investors and other stakeholders.